Form G.A.R.7 (previously known as TR6 Challan) should be used to make service tax payments. Payment of service tax may be made at the specified branches of the designated banks. The details of such Banks and branches may be obtained from the nearest Central Excise Office/Service Tax Office. Service Tax can also be paid electronically, using e-payment facility. (Please refer para 3.16 to 3.25). When is Service Tax required to be paid? What is the procedure to be followed for payment of Service Tax if full details are not available to assess the correct service tax liability ? Under what circumstances, provisional assessment is resorted to? as provided under sub rule (4) of Rule 6 of the Service Tax Rules, 1994, giving reasons for seeking payment of Service Tax on provisional assessment basis. On receipt of such request for provisional assessment, the Asstt. / Dy.Commissioner of Central Excise may allow payment of Service Tax on provisional basis on such value of taxable service as may be specified by him in a speaking order issued to that effect. In case the Service Tax assessee resorts to provisional assessment after following the procedure and furnishes the returns in Form ST-3A along with Form ST -3, it is the responsibility of the Asstt./Deputy Commissioner to complete the assessment after calling for from the assessee the relevant documents or records, as may be considered necessary by him. In terms of provisions to Rule 7 of Central Excise Rules,2002 as applicable to Service Tax, the order finalizing the assessment shall be passed as soon as the relevant information is received. What is the head of account into which the Service Tax amount is to be paid in respect of various services? must be mentioned on G.A.R. 7 (previously known as TR-6) challan for proper accounting. (See Appendix-1 of this Booklet). What is GAR-7 challan? Where is it available? No. For payment of Service Tax, specific bank has been nominated for every Central Excise/Service Tax Commissionerate. 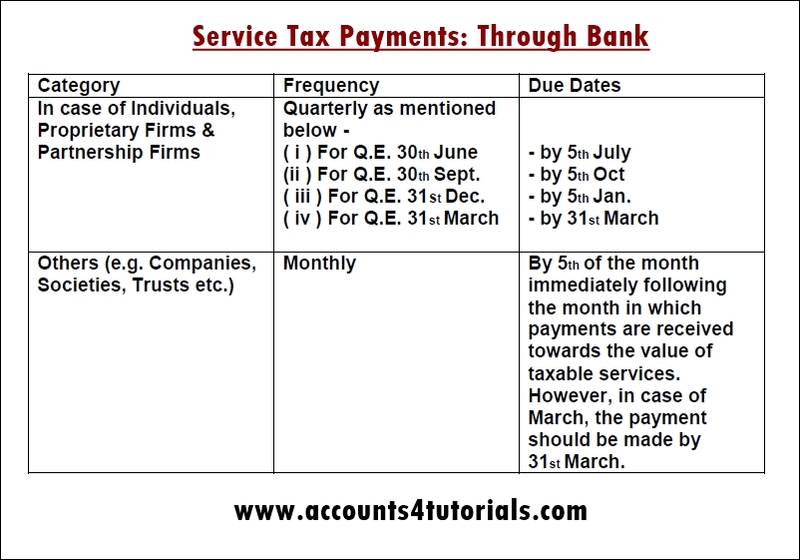 If Service Tax is deposited in a Branch /Bank other than the nominated Bank / Branch, it amounts to non-payment of Service Tax [Rule 6(2) of the STR, 1994]. In any case, a non-designated bank will not accept service tax challans. You may approach the local Service Tax Commissionerate to know the name of the nominated bank for payment of your Tax dues. Whether the payment of Service Tax is to be made for the billed amount or for the amount received? a) Service Tax is to be paid on the invoice amount or the billed amount. Where invoice is not issued within a period of 14 days then the tax becomes payable on the date of such completion of the provision of the service and on the amount mentioned in the invoice. 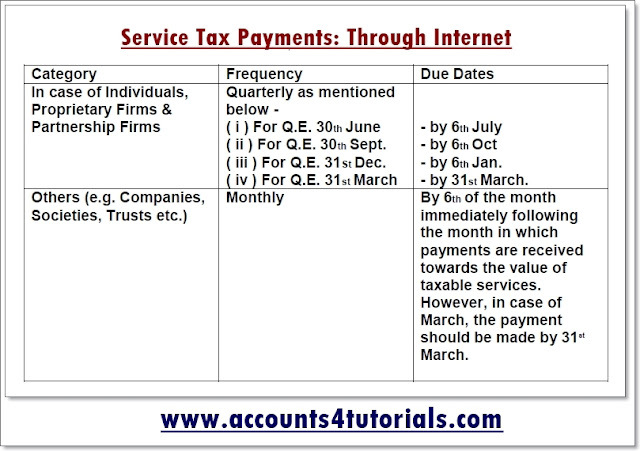 In any case issue of invoice is mandatory as per Rule 3 of Point of Taxation Rules 2011.
b) Further the amount of tax to be paid in a case where the person providing the service receives a payment before 14 days then it will be on the basis of the extent of such payment received by the service provider. For instance wherever any advance by whatever name known is received by the service provider to the provision of Taxable Service that advance will form the basis for calculating the Service Tax liability. Can service tax be paid in advance, where the gross amount has not yet been received? Yes. As per Rule 6(1A) of Service Tax Rules, 1994, service tax can be paid in advance to the credit of the central government and adjust the amount so paid against the service tax which he is liable to pay for the subsequent period. The assessee is required to intimate the details of the amount of service tax paid in advance to the jurisdictional superintendent of Central Excise/Service Tax within a period of 15 days of such payment and indicate the details of the advance payment made, and its adjustment, if any in the subsequent return to be filed under section 70 of the Act. Can service tax be paid by cheque? When paid by cheque, which date will be treated as date of payment? The date of presentation of the cheque to the bank designated by the Central Board of Excise & Customs for this purpose shall be deemed to be the date on which service tax has been paid subject to realization of that cheque. When payment is made by a client to an assessee after deducting his Income Tax liability under the Tax deduction at source (TDS) provision, whether the Service Tax liability of the assessee is only towards the amount actually received from that client or tax is to be paid on the amount including the Income Tax deducted at source also? Service Tax is to be paid on the gross value of taxable service which is charged by a Service Tax assessee for providing a taxable service. Income tax deducted at source is includible in the charged amount. Therefore, service Tax is payable on the gross amount including the amount of Income Tax deducted at source also. Can interest be waived, and by whom? Interest payments are mandatory in nature and the same cannot be waived. What are the penal consequences if the Service Tax is not paid or paid late? per month, whichever is higher. However, the penalty amount payable shall not exceed the amount of Service Tax payable. (Refer to Section 76 of the Finance Act, 1994). What is e-Payment of Central Excise and Service Tax? E-Payment is a payment made through which a Taxpayer can remit his tax dues to the Govt. 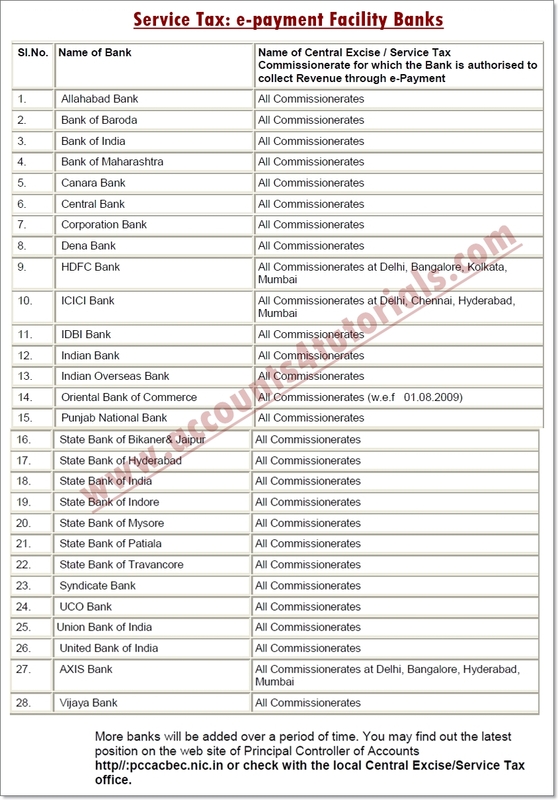 (CBEC) using Internet Banking Service. It is an additional facility being offered by the banks besides conventional procedure. Is E-payment of Service Tax mandatory? Yes. E-payment is mandatory for assesses who have paid service tax of Rs.10 lakhs or more including the amount paid by utilization of CENVAT credit, in the preceding financial year. (Refer Rule 6(2) of Service Tax Rules,1994). However, there is no bar for other assessees to pay their tax electronically. In other words, other assessees may also pay their service tax through e-payment, if they choose to do so. Which banks provide the facility of e-payment of Service Tax? The following banks provide e-payment facility. More banks will be added over a period of time. You may find out the latest position on the web site of Principal Controller of Accounts http://pccacbec.nic.in/ or check with the local Central Excise/Service Tax office. 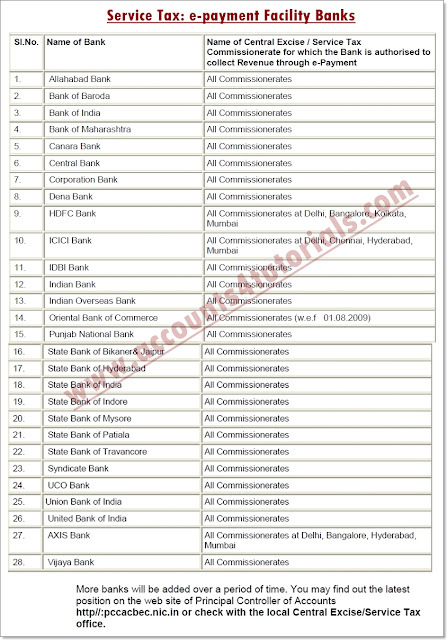 How to get Internet banking facility of Bank? The customers of Bank can request this facility on prescribed application forms to any bank having internet banking facility. Are there any geographical restrictions on Banks? No. Customer can effect payment from anywhere for the Commissionerate in which he is registered with, provided that particular bank is designated and authorized to collect revenue for that Commissionerate. Up to what time in a day the e-Payments can be made? E-Payment can be made 24 hours a day using Internet banking service of Bank. Payment made up to 8 pm will be accounted on the same day. However payments effected after 8 pm will only be included in next working day's scroll by the Focal point Branch. So, to ensure timely payment, e-payment should be made latest by 8 p.m. on the due date. Does the Internet banking service give any receipt/confirmation for the e-Payment? How does the taxpayer get the regular Challan stamped and receipted by Bank? The respective Focal Point Bank on the next working day will send the Challan copies duly receipted and stamped to the taxpayer by courier at the mailing address provided by the taxpayer.